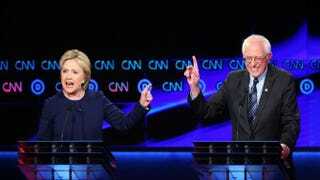 Democratic presidential candidates Bernie Sanders and Hillary Clinton participate in the CNN Democratic presidential primary debate in Flint, Mich., on March 6, 2016. On Wednesday, Univision News, along with the Washington Post, will host the next Democratic presidential debate in Miami, the second time in just four days that Bernie Sanders and Hillary Clinton will face off. The debate, which takes place at Miami-Dade College, will air in Spanish on Univision and will be simulcast in English on the Univision-owned Fusion network as well as CNN. Maria Elena Salinas and Jorge Ramos of Univision will moderate the event, along with Karen Tumulty of the Washington Post. With 246 delegates at stake in the Florida Democratic primary election Tuesday, March 15, Wednesday night’s debate will mark one of the last times the candidates will have an opportunity to make their case to Floridians and, more importantly, Latinos, who are essential to the party’s base.